I’ve gotta admit I’m still pretty salty that I was turned away from the Chicago stop of “The Dollar & A Dream Tour” last year, but I digress. 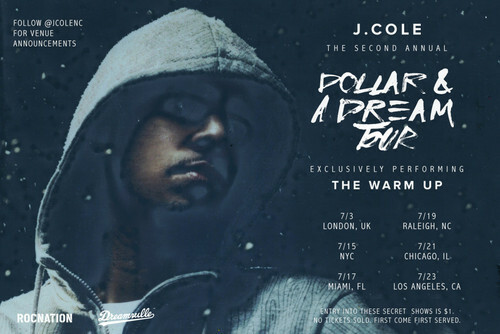 J. Cole is bringing the tour back with a new spin. To celebrate the 5th year anniversary of his mixtape, The Warm Up, the entire concert will be tracks from that project. It’s still a dollar at the door and he’ll probably tweet out the location the day of, but this is definitely a more intimate affair. Check out the dates and cities above and make sure to cancel everything you have planned that day. You can view a countdown until the tour and listen to the entire mixtape here. Also, check out the tour trailer below. Enjoy.